Everyone was silent. No one knew what to say and was speechless. John's mouth dropped open, for over a year he had wondered where Cynthia and his child have disappeared to and now they are standing right in front of him. John's eyes shifted between Cynthia and Julian. He looked into Cynthia's eyes, like he did many times before, but they didn't just read love, they also read fear. He then shifted back to Julian, who was looking back at him, wondering who this stranger is. It's like looking right into a mirror, John thought, that's my son, my boy, my child, my heir, my flesh and blood, he's adorable, lovely, Cyn and I did a beautiful job on him... then he shifted his eyes back to Cynthia, his blood started to boil, he became angry. Questions ambushed his mind and now he had a perfect opportunity to confront her. Suddenly, he spoke in this voice that makes people squirm in fear, "Neil, would you please take my son into my room and be with him with the door close, I want to be alone with Cynthia for a few minutes". Neil quickly as John ordered and while Mal, George, Paul, Ringo, and Brian scampered into Paul and Ringo's room and shut the door themselves to leave John alone with Cynthia, but pressed their ears to the door to listen. Cynthia was nervous... no, not nervous, she was scared. She had never before seen John so livid, angry yes, but not livid. His eyes were glaring like fire, right into her skull. Her hands played with each other nervously, she wanted to run to John's room to get Julian and leave- forever to not face John's wrath. "Sit down, Cynthia, I have a few questions to ask you," John started, patting his hand on the extra space on the white, overstuffed sofa. Cynthia wobbled to the sofa and sat, not looking forward to hear what John had to ask. "Tell me, why did you abandon me?" John asked, his voice was calm, struggling to keep from yelling at her. Cynthia looked at her hands, "Because I overheard you discussing to Mimi that you didn't want to get married..." She forced her eyes to remain staring at her hands, however, she wanted to see John's face, hoping that it'll be guilty, so she compromised, she kept her head down and looked at him from the corner of her eye. She saw that he wanted her to continue. She gulped, "so I decided that it'll be best for you to be free, to be with other girls, instead of marrying your pregnant girlfriend and settle down too young". After that, she turned her head and faced his face and watch his expressions going from anger to disappointment. John sighed, "So, you heard me Aunt Mimi and I talking about me being young and you decided to do the favor and free me... well, here's a news flash for you, Cyn!" His voice started to get loud, "I wanted to marry you, I went down to that damn registry office so that I could be your husband and you to be me wife! Who cares about being young? How do you know what I felt afterwards, after I had that discussion with Mimi, did you know that I lay in my bed that night, thinking about you and the baby, how I actually looked forward to be a father? Yes, it's true that I planned to marry you in a few years from that point, to raise with the Beatles and take you with me once things settled so that I could marry you, did you know that? I planned to get married to you regardless of what happened. When you announced that you were pregnant, yes, I was shocked, but I was WILLING to marry you!" John continued on, Cynthia started to shake and her eyes welled up in tears. Right there, she realized that her leaving was wrong, but it was understandable, she didn't know what happened after she overheard John and Mimi's conversation, she didn't know that while John lay in bed that night, he thought about her and the baby, looking forward to getting married and being a father; she made a mistake and she doesn't know how to fix it. "What did he say? What was that?" asked George, trying to press his ear as hard as he can against the door. "Hum, he said something about 'I went down to that damn registry office to be her husband... something, something, something�whoa, I heard this word very well, 'willing to marry you'... wow, John is really exploding out there!" said Paul, who had a glass cup against the door with his ear pressed against the bottom. "Do you think we should go out there?" asked Brian, "I mean, one of them could hurt himself or something awful," said Brian, sitting on the bed, watching George and Paul trying to overhear John's confrontation with Cynthia. "Oh, Brian, leave them alone, this has been a long time coming, you know how John was feeling since Cynthia ditched him," said Ringo. "But John may get hurt..." Brian protested. "By what? 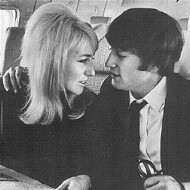 Cynthia is a type that won't hurt a fly," said George, trying to take the glass cup away from Paul so that he could hear what's going on this time, "remember, both Paul and I know her a lot longer than you... give it to me! It's my turn!" "Hold on, George, I'm trying to get the juicy stuff!" Paul told George, "So? I want to hear the juicy stuff too, give me the glass!" George protested. "Boys, boys, enough, give me the glass," Mal asked. George and Paul, looking like two naughty little boys gave Mal the glass. "Now move over, I want to hear this!" Mal shoved both George and Paul a side and ran to the door, pressing his ear on the bottom of the glass against the door. George and Paul gasped, realizing what Mal just did and ran to the where Mal was to reclaim the glass cup. Brian started biting his nails, asking himself over and over if he should go out there and see if he could do anything to keep John from getting hurt. Ringo sat next to Brian, rolling his eyes, trying to coax Brian out of his rescue motive and let John and Cynthia settle the score. "I don't hear anything now!" Mal exclaimed. After yelling all the things he held in his heart after over a year, John calmed down. After seeing red since seeing Cynthia and Julian at the door, his eyes started seeing back to color now. He got a good look at Cynthia, who was crying softly. He put his arm around her, she felt fragile, weak, cold, tense. She kept saying, "I'm sorry, I'm sorry, it was a big mistake, but I didn't know, please, please..." in a tearful voice. John began to soften. It must've been hard for her to make a decision like that, he realized that she loved him enough to try to give him his wishes, to set him free because that's what she thought he needed and wanted. He moved closer to her, his arms were around her, gently forcing her to put her arms around him and let her cry on his shoulder. He nuzzled his face into her neck, "I could understand now, but next time, talk to me rather than running away, okay?" Cynthia nodded, holding John tightly, it was great for him to be in her arms again, after so long. Before, she had ignored and pushed down her aches to be with him down, but now, a miracle has happened. John pulled away gently to put her face in his hands, "I have something for you..." he smiled. "What?" she asked, in a croaked voice. John got up and went over to his coat, pulling out a small box, "I've been saving this and carrying this around with me for over a year, hoping that one day I will run into you and give this to you... here, open it," giving Cynthia the small box. Cynthia took it with shaky hands, however, she felt calm. She opened it carefully and found two gold rings, one of them had a heart-shaped ruby built into the gold. She was speechless. "Here, one is your engagement ring," John explained, pulling out the gold ring with the ruby, "I've asked this once before, but now, I'm going to ask you again, Will you marry me and not run away this time?" Cynthia chuckled and accepted. John took her left hand and gently slip her engagement ring on her ring finger. After the ring settled on her finger, she dived into John's arms, swearing to herself that she will never let go this time around.